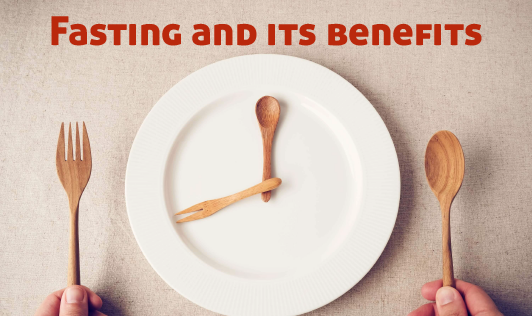 Fasting is an effective way to spark the digestive fire and burn away accumulated toxins from the body thus strengthening the immune system and clearing the mind as well. It also eliminates gas, makes the body light, improves mental clarity, and preserves overall health. Ayurveda favors regular, short-term fasting over infrequent, and long-term fasting. According to Ayurveda, withdrawing from food or water for long periods of time exhausts body tissues, which leads to doshic imbalance. • Fasting gives rest to our digestive system. When we are not eating much, our body uses its energy for healing and recovery. Body cells and tissues and organs are healed and repaired due to the removal of toxins and this leads to the improved immune system. • Fasting helps in weight reduction. Mostly we tend to eat more than what our body needs. This leads to weight gain. It is necessary to remember that if we completely starve our body for long period, our metabolism becomes slow and the body comes into energy saving mode. This will not help with weight reduction. It is better to eat light and eat wisely. • While fasting, we feel calm and focused. We get clarity of thinking. We tend to take our attention within. This helps in coming close to our inner being. It’s best to choose a fasting period in which you’ll be able to follow a peaceful, non-stressful fasting routine. When a person starts fast, he or she may feel hunger pangs and weakness. But with practice, the body becomes used to it, and then start feeling light. Disclaimer: Please consult your physician or other health care professional before undergoing any kind of fasting.